Properties of a type of plasmonic lens with variant diameters of aperture and different materials were calculated and analyzed in this paper. To systematically analyze the plasmonic lens for focusing, the finite difference and time domain (FDTD) algorithm was adopted for our computational numerical calculation. The plasmatic lenses are consisted of an aperture and circular rings penetrated through a metal film (Al, Au, and Ag) which is coated on a quartz substrate. We analyzed transmission properties of light through ten metallic sub-wavelength periodic rings in different metal films and aperture diameters. 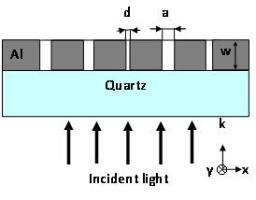 Then influence of geometrical sizes and materials on focusing performances of the lenses was investigated. Our computational numerical results demonstrate that focusing performance of the plasmonic lens with aluminum thin film is best compared to the other two metal films of gold and silver. These characteristics make the lens with Al film fully capable of being used as a lens with high resolution beyond diffraction limit for nano-photolithography.